A couple of years ago, I got a Nokia N-95 mobile phone with a piece of software installed which would read 2d barcodes knows as ‘QR Codes’ (The QR stands for Quick Response). QR Codes were developed by Japanese corporation Denso-Wave in 1994 and were initially used for tracking parts for a car manufacturer. They can store 4,296 alphanumeric characters (or 7,089 numbers) – much better than the standard 10 digits you get with a ‘normal’ barcode. The codes are very popular in Japan as most people have a smart phone, and any smart phone equiped with a camera can read and decode the matrix. They are used to store URLs, phone numbers, addresses etc. and are often seen next to contact details in adverts in magazines. 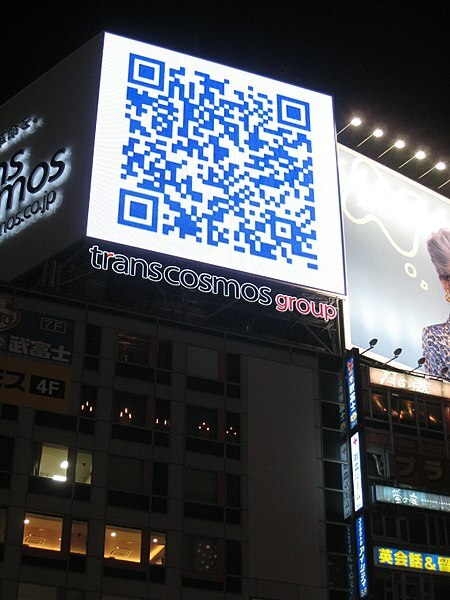 They can even be used as billboard adverts to be read at a distance. This allows mobile users to access your website without typing in URLs. It occurred to me that 4,296 characters is easily enough to write a short, informative description of a place of interest, and include a URL which could be clicked for more information. This would integrate nicely with a blog where you could have a post describing a place and its history, other interesting areas nearby etc. The excerpt could be encoded as a QR code and printed as a sticky label (as small as possible so it is not intrusive) and stuck on a post/wall/information board at the physical location. This would allow any visitor to the area to read the excerpt without an internet connection. The excerpt would contain a link to the full article on the blog and the comments fields could be used by visitors to record their experiences and recommendations of other places to visit. As more mobile phones have the ability to read these codes, I think this could be a really useful tool for visitors to a city. A nice crossover between the physical and virtual world! Jon: I whole-heartedly concur, it would make for a very pleasant addition to many blogs to enable readers to quickly scan the QR code and then read the blog at their leisure whilst traveling.. excellent pondering sir! .-= Jon´s last blog ..Seppuku =-. Trevor: An interesting idea, however I suspect QR technology will be leapfrogged in this area by AR browsers such as Wikitude, Layar and Metaio World. .-= Trevor´s last blog ..Cute Pricing for PS3 Eyepet =-.